in layers side by side. In the first one the boxes are lined up like soldiers. Since the most preferred method is to put the tuck and fold on the top and bottom of the boxes, the boxes are fed in on their sides to create the bundle. The bundle can range from 3-12 cajas, depending on thesis of the box and the scale of the machine. This bundling format is popular for retail store shelves. In the second configuration, the boxes are fed in on their backs and collated in layers into machine. The machine is designed so that multiple layers can be accommodated. Hasta aquí, Package Machinery has built them up to three layers deep on its servo ILW inline Wrapper. This is more popular in club stores or as an alternative to use of cardboard in secondary packaging. 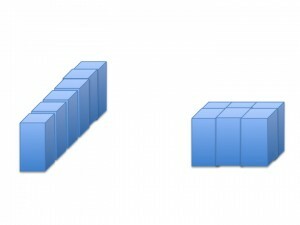 The size of the bundle is dependent on the size of the individual boxes, the strength provided by the individual boxes as well as the strength provided by the over wrapped bundle,. An over wrapped bundle is different from a shrink wrapped bundle because the overwrap process does not distort or put undue strain on any section of the bundle, which can occur with a shrink wrap. Overwrap also more easily accommodates printed film. While both bundle styles cannot be accommodated on the same machine without major modifications to accommodate different infeeds, the bundle option will help in the reduction of secondary packaging as well as in offering retailers custom configurations for their shelves. Bundling can create the opportunity to provide custom bundle sizes to retailers and club stores. It is also a golden opportunity to reduce use of cardboard. Overwrapping a bundle can create greater strength in the bundle than exists in an individual boxes, because the boxes and overwrap create greater support for the total package. This permits the manufacturer to reduce use of corrugate or chipboard cardboard. That reduction will create savings in transportation and cardboard material. For more on why bundling should be considered read about the Possibility of Increased Producer Responsibility.